The 416th St. Casimir’s Fair in Vilnius started with the St. Casimir’s March from Lukiškės Square to Kudirkos Square where the fair was solemnly declared opened on the 4 m high bridge over Gediminas Avenue. This year, visitors of the fair found numerous attractions, entertainments and novelties. Throughout the March 1-3 weekend, capital city dwellers and city guests were able to see not only the articles of craftsmen offered but were also offered musical performances ranging from blues to folk music which was given near Odminių and K. Sirvydo squares, at the gates of the Bernardine Garden, near Gedimino Ave. 21 and in the Town Hall Square. "I congratulate and invite everyone to the festival of the city Vilnius which dates back more than 400 years and attracts guests from different cities of Lithuania as well as from foreign countries. I invite you to enjoy the capital city, visit all areas of the fair – those which feature music of different styles and those which offer different handmade goods, I encourage you to communicate with the traders and listen to their stories," capital city mayor Remigijus Šimašius said during the opening of the fair. 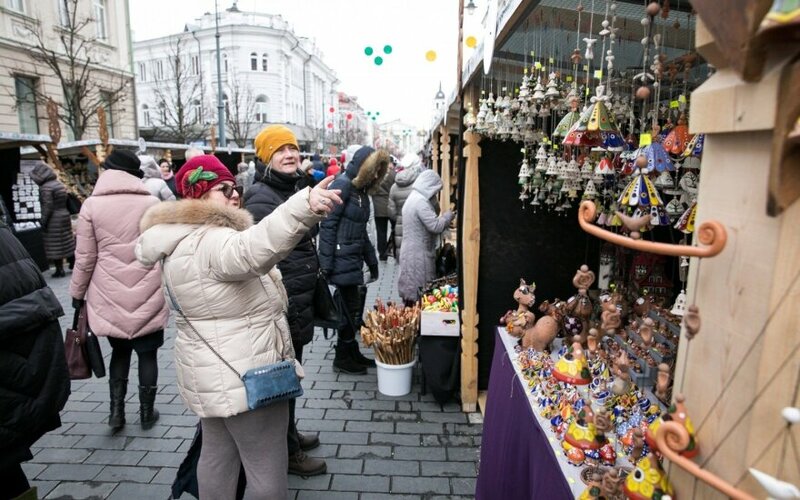 Marketplaces full of articles of craftsmen, fairing and dainties stretch for as many as 4 kilometres running through the Old Town and the city centre: Gediminas Avenue, Lukiškės Square, Town Hall, Vincas Kudirka and Cathedral Squares, Žemaitės, Odminių and Konstantino Sirvydo park squares, T. Vrublevskio, Šventaragio, Barboros Radvilaitės, Maironio, Pilies and Didžioji streets as well as the side of Vokiečių street with the odd numbered houses. Perhaps the major new thing this year is the 4 metres high bridge over Gediminas Avenue near Vincas Kudirka Square. Visitors of the fair could take a look over the bursting fair while on the bridge. "I greet all craftsmen who have arrived here and have always been the main drivers of the festival and have allowed as to see what was happening not only in Vilnius but in the surrounding regions. I also greet local craftsmen who demonstrate the latest trends. You will find all their best articles in the fair," representative of craftsmen Mr Dainius Strazdas said. He recommended everyone to take a pause near each craftsman since something valuable might be lying on any craftsman's display table. One more new thing this year is that part of the fair will be dedicated to children – "Children's St. Casimir's Fair". Over 100 young craftsmen and creative children will present their handmade articles. The opening of the Children's St. Casimir's Fair is to take place on 2 March at 11 a.m. in the Town Hall Square. This year, the fair had more than 1,500 participants. Most of them will offered non-food products. 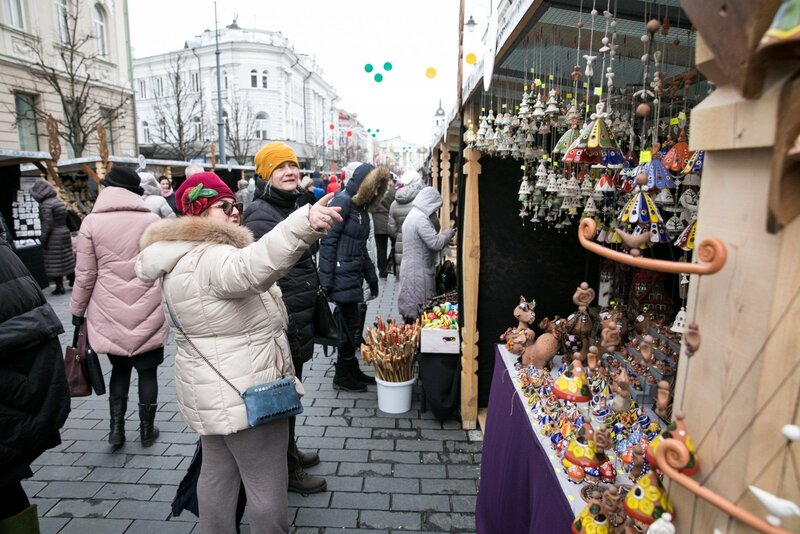 Over 150 craftsmen and food producers came from the neighbouring countries – Latvia, Poland, Ukraine, and Belarus and settled down in the Town Hall Square, Lukiškės Square, and the Cathedral Square. Meanwhile, the Gediminas monument is to mark the location of the designers' area. Here, articles of more than 70 designers and modern artists will be displayed and offered for sale.